Are you ready for iOS 8? Apple will officially release iOS 8 for the iPhone/iPod touch and iPad at 10 a.m. PDT. Want to know how many people around the world are using the new software? 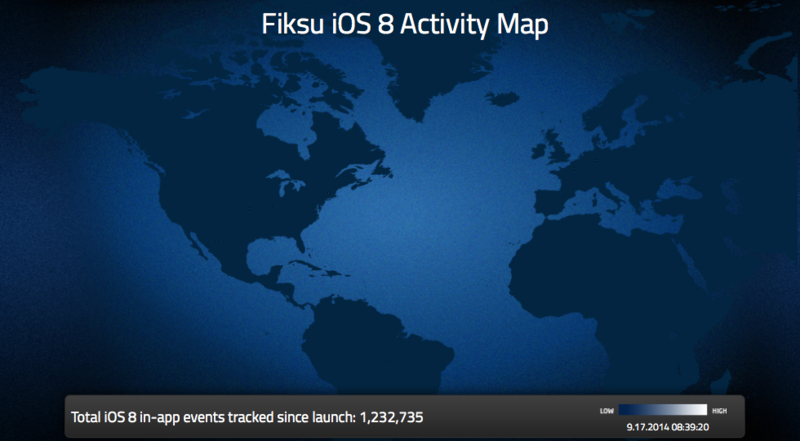 Take a look at the Fiksu iOS 8 Activity Map. The new website shows where iOS 8 is being used around the world. It also includes a chart that tracks iOS 8 usage relative to prior iOS launches, and an iOS usage monitor. The Fiksu iOS 8 Activity Map also shows the iPhone and iPad models people are using. Expect some big changes to occur here beginning on Friday, Sept. 19 as the iPhone 6 and iPhone 6 Plus are released. Data comes from apps using the Fiksu SDK that are reporting in-app events that include app launches, in-app purchases, and registrations. For the charts, data is sampled hourly in batches of approximately 10M events and filtered to count unique devices. For the map, data is pulled in real time and filtered to show just events from devices running iOS 8. Devices using operating systems older than iOS 5 are not counted, and represent a negligible amount of total traffic. Our map is zoomed in to show the US and Europe because the majority Fiksu’s clients focus on user acquisition in those areas, and our data on Asia-Pacific may not be representative. As a reminder, the newest iOS version is compatible with the iPhone 4s, iPhone 5, iPhone 5c, iPhone 5s, iPod touch 5th generation, iPad 2, iPad with Retina display, iPad Air, iPad mini, and iPad mini with Retina display. The recently announced iPhone 6 and iPhone 6 Plus come with iOS 8 preinstalled. The iPhone 4 cannot run iOS 8. To update from your iOS device, go Settings > Software Update. In iTunes, go iTunes > Check for Updates and follow the directions. The latest iOS version features Apple’s new Health app, plus updates to both the Photos and Messages apps. It also includes Family Sharing, the iCloud Drive, and the ability to add third-party keyboards. See also: How to avoid having iOS 8 automatically downloaded on your device, Paper by FiftyThree goes 2.0 with iOS 8 optimizations plus new Mix creativity platform, and Apple confirms SMS Continuity feature in iOS 8 won’t arrive until October.